Whose Dog IS That, Anyway? 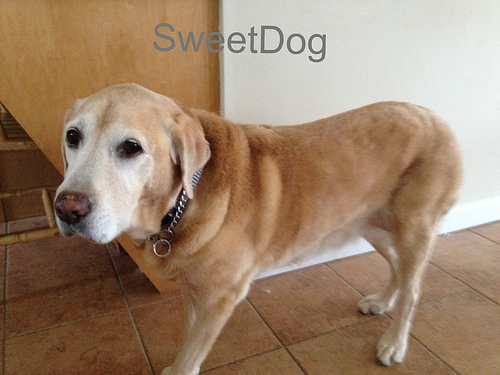 Below is a picture of SweetDog. Please note her color. Our first home was a sweet little cape style house with a fenced in deck and yard. It was so perfect for SweetMan and I and our SweetDog. That puppy pie had the run of the back yard. All quarter acre of it! And she could sit on the deck and bark at the passing UPS and FedEx delivery trucks all. day. long. (The neighbors actually threw a party when we left. I think. At least, I think it was because Sweetdog was leaving. Not us. Of course not us…) She could also bark at the endless stream of “friends” from nature that emerged from the muddy, mucky, ravine running along the side of our home. One fine day, when I was about eight months pregnant with SweetBoy, I had taken my first “baby” for a nice long walk and come back home for a shower, lunch, and then nap. (I knew how to pack a day full of fun, you see.) Our deck gate, at the time, had a latch that was a bit persnickety. If you didn’t make sure to close it all the way, it wouldn’t… Well, close. I blame what happened next on the preggo brain. I’d walked back up onto the deck with our Sweetdoggie Girl, closed the gate, and lumbered heavily off to the shower. When I came outside to invite SweetDog in for a little naptime with Mama, she was nowhere to be found. And the gate – it was wide open! What a sight I must have been! Hair in the oh-so-glamorous after-shower towel wrap. Belly out to the next house. Bunny slippers on. No, I jest. They weren’t bunny slippers. Cows, I think. Yes, cows. How fitting. There I am in all my beautious-ness, running frantically down the street, yelling out Sweetdog’s name over and over, praying that she’s okay. It’s the middle of the morning. All of my neighbors were at work. Or pretending that they were. And I couldn’t find her anywhere. I began to truly panic. Then, I started to have Braxton Hicks. You know, those fakey-do contractions? At least, I was telling myself that’s what they were. Surely, surely, the Lord would NOT have me deliver my baby in the middle of the street! With a towel on my head and cow slippers on my feet. Right? Right?! Me. I am THAT ding-dong. Upon closer inspection, I noticed a very familiar Vera Bradley dog-collar around the neck of this formerly-yellow-dog. (Thank you to The Nana!) I called SweetMan back. I was miraculously “healed” of my contractions. The dog was safe and with me. (He was still at work because he knows me. He knew I probably forgot to latch the gate. He knew SweetDog wouldn’t stray too far, (she does know where the food comes from!). What he did NOT know is that I would spend the better part of the next 2 hours re-showering myself as I also attempted to get a very black dog yellow again. ← Cussin’, Cursin’, and Swearin’ – Oh My!